In the past year, 136 young Black men have been killed in confrontations with police. This loss of life occurring in black neighborhoods has risen to the level of a national emergency with radical left politicians stoking the flames of anger and outrage that resulted in a number of protest marches, civil unrest and assassination-style killings of police officers. The hypocrisy of the left is revealed by the fact that politicians — especially Democratic presidential candidate Hillary Clinton and her war-on-women cohorts — and activists cheer the rampant extermination of unborn babies in minority communities coast-to-coast. Yet, these same people will become emotional at the report of a police officer killing a suspect even before they know the whole story. “Part of Clinton’s presidential campaign strategy is to throw cops under the Democratic Party’s bus while vilifying anyone who dares to even question the legality or the unrestricted availability of abortion. It’s just more proof of the Democrats’ hidden agenda,” said former police detective Nora Pellegro. “I can’t fathom the psychology of a person who cries at the thought of executing a cop-killer, but treats the killing of unborn babies like a virtuous act to be applauded and cherished,” Pellegro said. According to the head of Issues4Life Foundation leader Walter B. Hoye, himself an African American, totaling almost 21-million since Roe v. Wade in 1973 and 429,000 last year, that number is a whopping 3,154 times as many Black lives taken by abortion each year as are killed by the police. Yet the pro-abortion industry and their political supporters went ballistic when there were attempts at defunding Planned Parenthood and its $550 million dollar-a-year government subsidy for its genocidal mission, including the sale of babies’ body parts. Meanwhile, the media ignores the contradictions between this harsh reality and the promises of the left, who fail to notice the suicidal implications for their own political futures. Recently Walter B. Hoye II, President of the Issues4Life Foundation interviewed Dennis Howard, President of the Movement for a Better America, one on one to dig deeper into the subject of lives that matter. The conversation was eye opening. “That’s next to impossible, as both McCain and Romney found out,” Howard noted. “The flaw in this strategy is that abortion has taken such a huge toll on future Black voters that the chances of continued success of this strategy are dim. More than half of those 20.4 million innocent Black babies killed by abortion would be of voting age today. That means at least 10 million missing young Black voters, and a serious dent in future Democrat margins,” he said during his interview with Hoye. 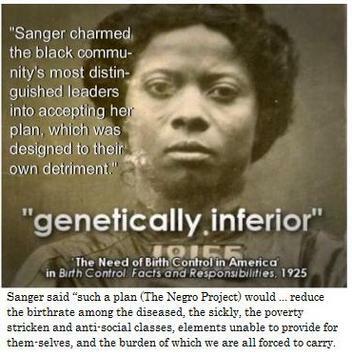 She further contended that “there is no doubt in the minds of all thinking people that the procreation of this group should be stopped.” That many Americans of African origin constituted a segment of Sanger considered “unfit” cannot be easily refuted. There is also a incestuous relationship between the Democratic Party and its politicians and Planned Parenthood. The government gives the group millions of taxpayers’ dollars each year. Planned Parenthood then distributes that money back to the Democrats who use it to win elections. “It’s a scam. It’s a way to get Americans to donate to both abortion clinics and to Democrats beholding to Planned Parenthood. Actually, it’s a method used by organized crime to ‘launder’ money,” former police investigator Manual Peron noted.